Washington Post columnist E.J. Dionne asks the right question. I think the answer to that is no. Stupid politics leads to stupid policies that will continue to harm our interests and undermine our way of life. What stupid politics does Dionne have in mind? The study found that the top 400 households “paid 16.6 percent of their income in federal individual income taxes in 2007, down from 30 percent in 1995.” We are talking here about truly rich people. Using 2007 dollars, it took an adjusted gross income of at least $35 million to make the top 400 in 1992, and $139 million in 2007. Our discussion of the economic stimulus is another symptom of political irrationality. It’s entirely true that the $787 billion recovery package passed last year was not big enough to keep unemployment from rising above 9 percent. But this is not actually an argument against the stimulus. On the contrary, studies showing that the stimulus created or saved as many as 3 million jobs are very hard to refute. It’s much easier to pretend that all this money was wasted, although the evidence is overwhelming that we should have stimulated more. Dionne goes on to lament the rules of the Senate which enable a minority of conservative Senators from small states who represent 11% of the population to block legislation approved by Senators representing 89% of the public. That is not democracy—it is the very definition of tyranny. The United States used to be the envy of the world, but on almost every dimension of flourishing—life expectancy, literacy, education, healthcare, exports, employment, poverty—the United States is falling behind the rest of the developed world. And the public seems not to notice. 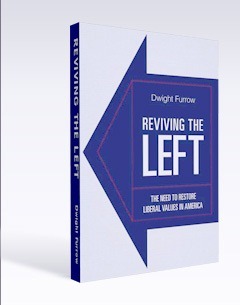 As I described in Reviving the Left, Republicans have prosecuted a so-called “values” agenda in which, regardless of how corrupt, dishonest, or incompetent they are, they are viewed by the public as authentically American. When that “values agenda” is supported by the financial resources of corporate America, it may be impossible in the short run to defeat the stupid. Changes in values takes time—and generational change. The mainstream media has been inept and quite frankly irresponsible in its reporting on rightwing shenanigans. But there is evidence they are beginning to get a clue. …The Sherrod story is a reminder — much like the 2004 assault on John Kerry by the Swift Boat Veterans for Truth — that the old media are often swayed by controversies pushed by the conservative new media. In many quarters of the old media, there is concern about not appearing liberally biased, so stories emanating from the right are given more weight and less scrutiny. So the news-and-information conveyor belt moves stories like the Sherrod case from Point A to Point Z without any of the standards or norms of traditional journalism, not only resulting in grievous harm to the apparently blameless, such as Sherrod, but also crowding out news about virtually anything else. Political discourse in this country will not improve until responsible members of the media push back against the corporate shills who occupy editors’ desks and regain their commitment to telling the truth. Maybe Halperin’s piece is evidence of a nascent return to responsible journalism. No doubt a healthy democracy requires competition between multiple parties. And although I am avowedly liberal in my political views, I recognize the value of conservative thought and the necessity of keeping the worst liberal instincts in check. But this point of view requires an opposition party that has the good of the country as its aim and is capable of rational action. Via Brad Delong, Martin Wolff, economics columnist for the Financial Times, makes the case that this does not describe today’s Republican Party. My reading of contemporary Republican thinking is that there is no chance of any attempt to arrest adverse long-term fiscal trends should they return to power. Moreover, since the Republicans have no interest in doing anything sensible, the Democrats will gain nothing from trying to do much either. That is the lesson Democrats have to draw from the Clinton era’s successful frugality, which merely gave George W. Bush the opportunity to make massive (irresponsible and unsustainable) tax cuts…. Indeed, nothing may be done even if a genuine fiscal crisis were to emerge. According to my friend, Bruce Bartlett, a highly informed, if jaundiced, observer, some “conservatives” (in truth, extreme radicals) think a federal default would be an effective way to bring public spending they detest under control…. To understand modern Republican thinking on fiscal policy, we need to go back to perhaps the most politically brilliant (albeit economically unconvincing) idea in the history of fiscal policy: “supply-side economics”. Supply-side economics liberated conservatives from any need to insist on fiscal rectitude and balanced budgets. Supply-side economics said that one could cut taxes and balance budgets, because incentive effects would generate new activity and so higher revenue…. Supply-side economics… allowed them to promise lower taxes, lower deficits and, in effect, unchanged spending. Why should people not like this combination? Who does not like a free lunch?… [T]he Republicans were transformed from a balanced-budget party to a tax-cutting party. This innovative stance proved highly politically effective…. I did not find such a claim credible, based on the available evidence. I never have, and I still don’t. Indeed, he has referred to those who believe this as “charlatans and cranks”. Those are his words, not mine, though I agree. They apply, in force, to contemporary Republicans, alas…. What conclusions should outsiders draw about the likely future of US fiscal policy? First, if Republicans win the mid-terms in November, as seems likely, they are surely going to come up with huge tax cut proposals (probably well beyond extending the already unaffordable Bush-era tax cuts). Second, the White House will probably veto these cuts, making itself even more politically unpopular. Third, some additional fiscal stimulus is, in fact, what the US needs, in the short term, even though across-the-board tax cuts are an extremely inefficient way of providing it. Fourth, the Republican proposals would not, alas, be short term, but dangerously long term, in their impact. In sum, a great deal of trouble lies ahead, for the US and the world. Where am I wrong, if at all? Nowhere. He is not wrong. I think that there is little doubt that, should Republicans come to power, the global dominance of the U.S. will come to an end. The public is simply unwilling to bear any costs to keep our infrastructure, educational institutions, and social capital healthy. And that ignorance and lack of will is constantly reinforced by the Republican Party. The so-called tax revolt that Republicans have been exploiting for years is a cancer that will eviscerate our prosperity. Last week, a coalition of civil rights organizations, students and parents filed a lawsuit charging California with an unconstitutional failure to provide adequate education for its K-12 students. Meanwhile, the California Budget Project’s report on the state of our schools asserted that California’s school spending per pupil is near the bottom when compared to other states; it is last in school spending as a percentage of personal income;and last in the number teachers, counselors, librarians, and administrators per student. A few days before, Gov. Arnold Schwarzenegger had offered his contribution to improving the schools. As one way to streamline the state bureaucracy, he suggested, eliminate the post of the elected superintendent of schools. (Yes, it’s ironic, but it’s true). That is it? That solves the problem of underfunding education? As Schrag points out, Arnold is just not serious. It’s not a new idea, in fact it’s antique, a staple of constitutional reformers for the past two decades. We have a stupid, convoluted system with an elected superintendent supposed to administrator policies established by a board appointed by the governor. And of course it’s the governor who, as much as anyone, controls the budget. So the problem isn’t with the superintendant who has little independent power and little control over the budget. Schwarzenegger does have a secretary of education – in fact he’s had many, too many to count, a revolving door of secretaries — but he hardly notices them. If there are any Throttlebottoms in his administration, the secretaries of education are among the leading candidates. It’s hard to decide what’s most deplorable in this picture. Is it the additional hardships and disadvantages imposed on the state’s poorest kids, who have long been consigned to the poorest schools and, in a disproportionate number of cases, to the weakest teachers, and sometimes to no regular teachers at all? Is it the fact that even the state’s white, middle-class students achieve lower scores on national tests than their peers in other states? Is it the fact that California’s college graduation rates are low in a nation whose own graduation rates have been steadily falling behind those of our economic competitors? Or is it the short-sightedness of state policy where almost no one has the courage to point out that our overall tax burden compared to other states is about average, and that contrary to myth, our great periods of economic growth coincided with higher taxes? Of course Arnold is on his way out. What is Meg Whitman’s solution? More mass layoffs of public employees and further massive cuts to public services. Yup. That will solve it. It’s been obvious for quite some time–dating back at least to the fall of 2008–that the Republican Party is undergoing an ideological transformation that really is historically unusual. Normally political parties that go through two consecutive really bad electoral cycles downplay ideology and conspicuously seek “the center.” Not today’s GOP, in which there are virtually no self-identified “moderates,” and all the internal pressure on politicians–and all is no exaggeration–is from the right. This move to the right is bad for the country. The emergence of ideas that are bizarre, offensive, and delusional does not help our political process; it only poisons the discourse. But there is a good chance that this strategy may backfire. In addition to pushing into the limelight candidates like Sharon Angle and Rand Paul that are too far out of the mainstream to win elections, there may be long-term prospects that Democrats can exploit. If, as is almost universally expected, Republicans have a very good midterm election year after a highly-self-conscious lurch to the right, will there be any force on earth limiting the tactical radicalism of conservatives going forward? I mean, really, there’s been almost no empirical evidence supporting the “move right and win” hypothesis up until now, and we see how fiercely it’s embraced by Republicans. Will 2010 serve as the eternal validator of the belief that America’s not just a “center-right country” but a country prepared to repudiate every progressive development of the last century or so? That could well be the conviction some conservatives carry away from this election cycle, and if so, what would normally pass for the political “center” will be wide open for Democrats to occupy for the foreseeable future. It is difficult to hope for the continuation of the lunatic ravings of Sarah Palin and Michelle Bachmann. The embarrassment of them being nominally American outweighs whatever comic possibilities they create. But if they continue to push the rightwing off the political map, the embarrassment might be assuaged by their increasing irrelevance. Today is Wednesday, one of my optimistic days. The United States’ technological development and infrastructure used to be the envy of the world. But no more. It is so much more important for each of us to save a few pennies on taxes than to make sure our roads are paved. In Michigan, at least 38 of the 83 counties have converted some asphalt roads to gravel in recent years. Last year, South Dakota turned at least 100 miles of asphalt road surfaces to gravel. Counties in Alabama and Pennsylvania have begun downgrading asphalt roads to cheaper chip-and-seal road, also known as “poor man’s pavement.” Some counties in Ohio are simply letting roads erode to gravel. Hey. There are very few paved roads in Haiti. Think of the money they save. A broad overhaul of the nation’s financial regulatory system, intended to address the causes of the 2008 economic crisis and rewrite the rules for a more complex — and mistrustful — era on Wall Street, cleared one last procedural hurdle in the Senate on Thursday as it headed for final Congressional approval later in the day. ….With the Senate poised to send the bill to President Obama for his signature, the White House was already planning a ceremony — sometime next week — to mark completion of another landmark piece of legislation, following the enactment of the historic health care bill in March and last year’s major economic stimulus program. In any case, I think this probably marks the end of Obama’s major legislative agenda. I don’t give Congress much chance of passing a climate bill, and after the midterms the Democratic majority will either be gone or significantly reduced, making large-scale legislation just about impossible. Still, if you’re a liberal, this is the best you’ve had it for a very long time. Whether this is cause for cheer or cause for discouragement is, I suspect, less a reflection on Obama than it is on America writ large. Say what you will about Obama’s political strategies, he and the Democrats have indeed accomplished a lot. The fact that the American public disapproves of these accomplishments and is ready to throw the Democrats out of power, bringing back the minions of George Bush, tells us a lot more about the American people than it does about Obama.